Contains ceramic pieces (which simulate the stones and the original materials), cardboard structure guides, glue, scenic material, and guided instructions. 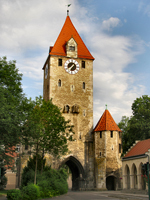 The east gate at the east edge of the old part of Regensburg, Germany, was built around 1300 to protect the old city entrance. This Gothic building consists of a square tower with two octagonal towers at both flanks.